How do you live with what you have? Our wealth and possessions are an expression of God’s kindness to us. However, at times we may misuse what God has blessed us with, placing more value on our riches than on the people He has placed in our lives. Our focus sometimes shifts from a reliance on God to our own abilities to accumulate and keep our wealth. We become people focused only on our present circumstances. So how do we as Christians handle wealth and the blessings God has given us? How do we live lives that follow what God's design for life? Join us as explore what James has to say about this in our latest sermon series. Are you a planner? We may do it differently and use various methods, but in one way or another we all like to have a plan. We set reminders on our phones and mark appointments on our calendars. We have retirement plans in order and college funds funded. We are planners. But, how do we as Christians, approach planning? Does God have anything to say about our plans and how we make them? How does our faith interact with our desire to plan? Join us as explore what James has to say in our latest sermon series. Are you a planner? We may do it differently and use various methods, but in one way or another we all like to have a plan. We set reminders on our phones and mark appointments on our calendars. We have retirement plans in order and college funds funded. We are planners. But, how do we as Christians approach planning? Does God have anything to say about our plans and how we make them? How does our faith interact with our desire to plan? We have all experienced conflict in many areas of our lives. Be it at home within the family, with your spouse, on the job, or with friends, it is a reality that we live with. All too often, we experience conflict within the church too. These conflicts do not represent Christ well. So, how do understand conflict and what hope do we have of reducing it? 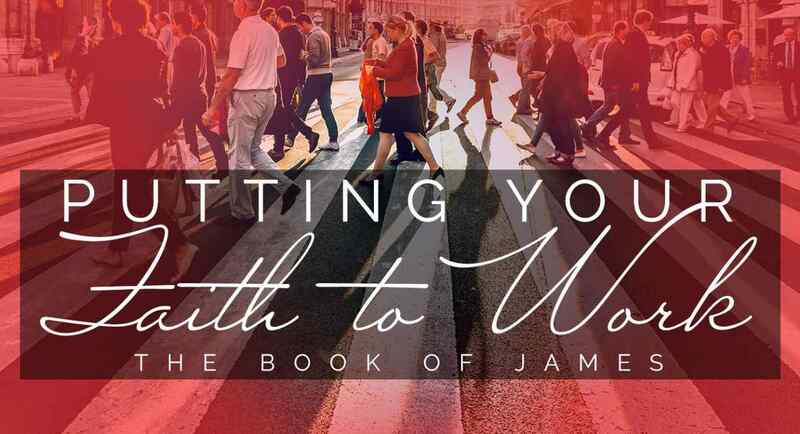 Listen in as we continue in the book of James in our series, "Putting your Faith to work." Have you ever said something that made someone's day? Or uttered some misplaced words that led to bad consequences. Our words are more powerful than we realize. Our tongues are a small part of our physical body, but has incredible control over all aspects of our lives through what we say. So how do we maintain control over our tongue before it controls us? How do we live lives where our words bring God glory and not dishonor? In the book of James, he addresses the relationship between our words and our faith. Join us as explore what he has to say, in our sermon series on the book of James. What's more important to you? What people say or what they do? How does it play out in your own life? Do you put more emphasis on what you believe or on how you live out what you believe? Listen in as we look at the book of James, in our series Putting Your Faith to Work.